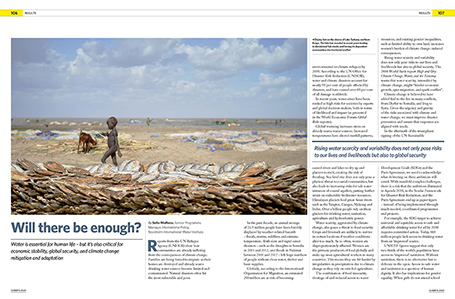 Climate 2020 is the third edition of UNA-UK’s major series on climate change. With contributions from UN, government, science, business and civil society experts, the publication provides insights and recommendations on how to make good on the aspirations of the Paris Agreement. The publication is a comprehensive, practical and accessible guide to support the fulfilment of the Paris Agreement’s ambitions and is unrivalled in its scope and calibre. 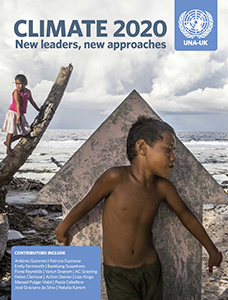 Climate 2020 builds on UNA-UK’s flagship series on the post-2015 development agenda: Sustainable Development Goals. The series, which counts current and former heads of state among its readers and contributors, has attracted a dedicated following of policy-makers and influencers across the world. The publication is edited by Natalie Samarasinghe, with articles from leading authorities, including António Guterres, Patricia Espinosa, Fiona Reynolds, Lise Kingo, Manuel Pulgar-Vidal, Natalia Kanem, Bambang Susantono, AC Grayling, Helen Clarkson and Varun Sivaram.